This is the before shot that she took when she listed it as "free - come and get it!" And, that's exactly what I did. If you're noticing the awesome wood floors and large baseboards, those would be in her lovely, old log home. 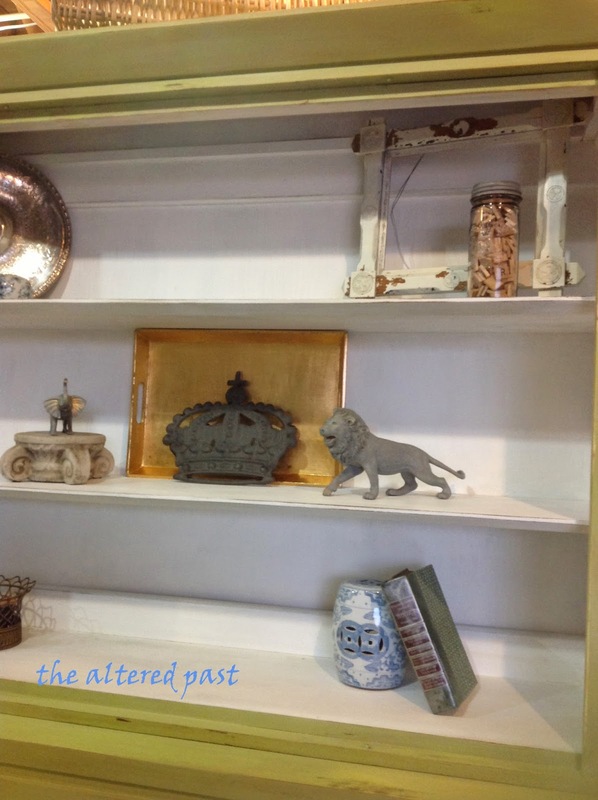 I'm an old house fan and I tried not to be too nosy while we were loading the china cabinet but the exposed beams, wood floors, huge foyer were speaking to me! After a little paint, removing the doors, and adding hardware, here she is. Try not to notice the floors or anything else in the background of this photo. 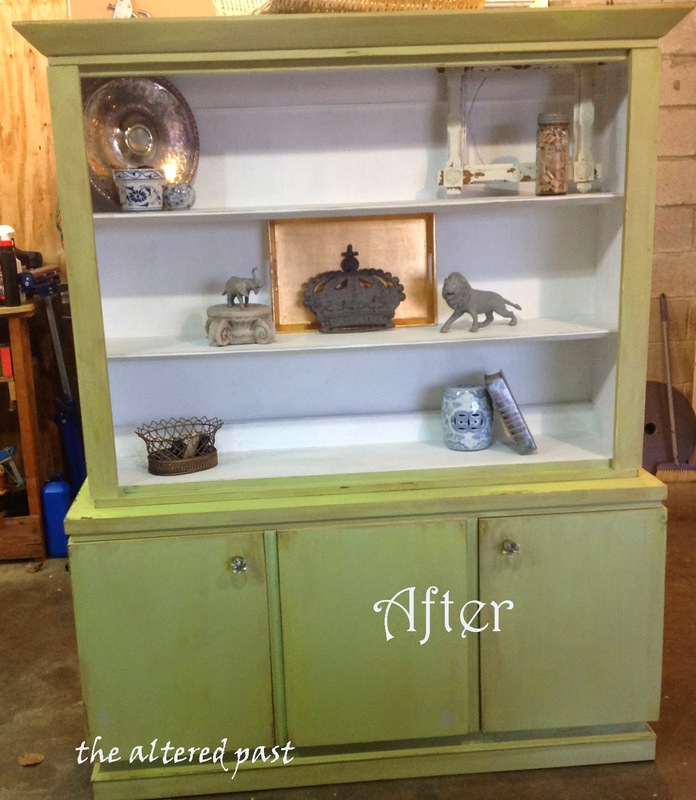 I had just finished the cabinet and decided to stage it right there in the garage. 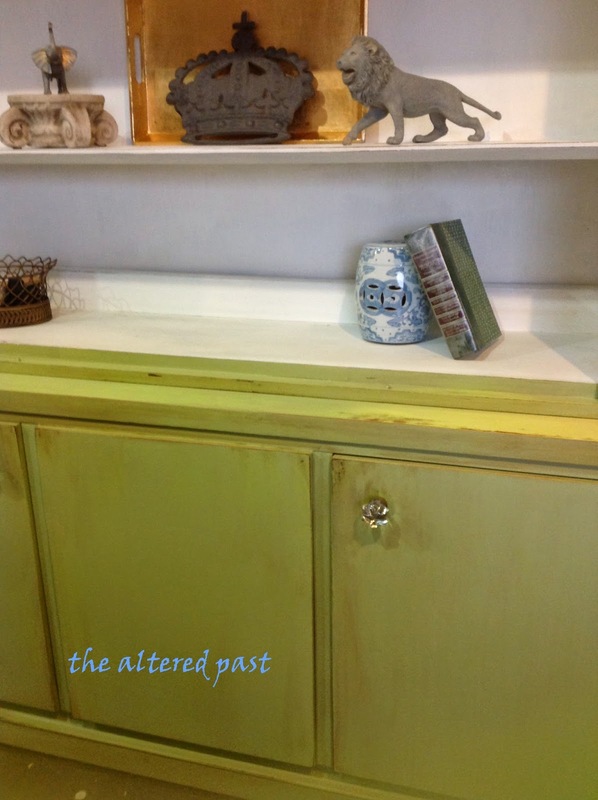 The paint is a beautiful apple green with an umber glaze over top. The photo isn't quite showing the true color. I believe it's the fluorescent lights in the garage. The prep work required was just a little cleaning with Greased Lightning to remove any residues. I sanded the seams where the "frame" pieces had been on the bottom doors. The paint was actually a latex wall paint left over from my daughter's room. The umber glaze is an old can that I've had for a while. It's actually clear but I tint it with acrylic paints for each project. That way I can control if I want a darker brown glaze or a golden brown glaze. The glaze helps seal the paint and gives it a satin finish. Since the doors did not have original hardware, I added these glass knobs. I'm not sure they will stay but I happened to have them on hand so I'll use them for now. Even though the bottom storage area is the entire width of the cabinet, the center door does not open. 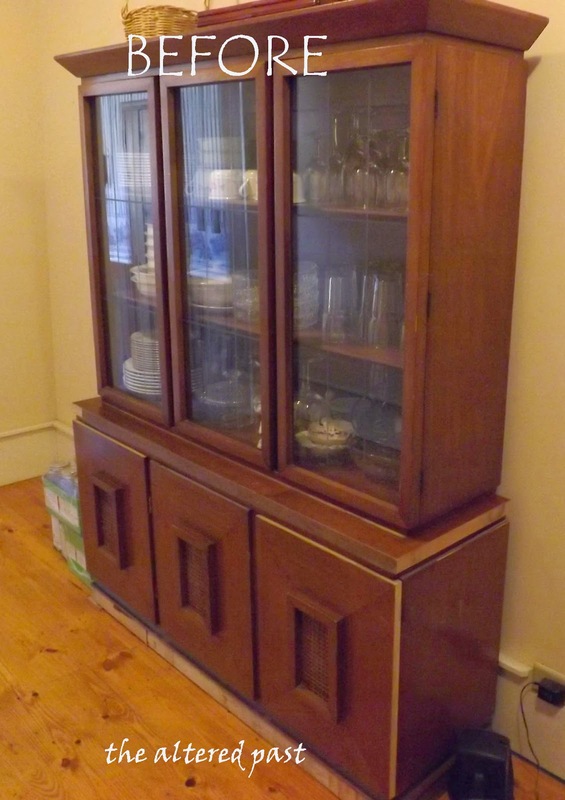 I liked the glass doors but I wanted the cabinet to be more of an open hutch. I still have the doors. I'll save them for another project. The cabinet now sits outside of my studio door (aka my room in the garage). It contains quite a bit more than the pieces in the picture but it makes the perfect place to hold decorating items I'm not currently using in the house. If you have beautiful things, it's still nice to look at them even when they aren't being used. I know it's been a few weeks since I last posted but life in the real world grabs our attention from the virtual. We experienced the loss of my daughter's friend and one of my tutorial students. He was hit by a driver under the influence of drugs while he was changing the tire for his mother. Such a tragedy. Our prayers are with the family as they walk through this. We are also coming to the end of our school year which requires a lot of time in registering new students for the upcoming fall. I hope to be back in full swing soon!